Checking back on last year’s bloom day post, I see that pretty much the same flowers are blooming, despite our thus far cool and rainy summer. Hollyhocks and bee balm being two notable exceptions: both have buds, but aren’t blooming yet. Other laggards: I have larkspur coming on, but I’m not sure it even has buds. The “annual” dianthus that came back for a second year bloomed in early June, and is now cut back in hopes of getting a second flush of bloom. And I have Allegheny vine blooming this year. Click on any photo below for more detail. 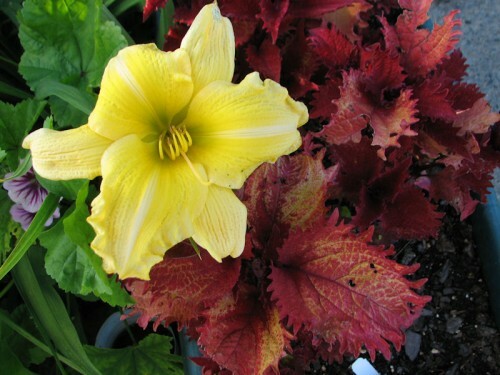 The daylily was purchased in 1995, the coleus was sent by Ball Horticultural to trial, and the Zebrina mallow was self-sown. It's become a tradition with us to grow annual poppies in the vegetable garden. In the background: dinosaur kale, a lot of potatoes, and the corn patch. You can see ‘Dark Towers’ penstemon in the background. Last year, I received one plant on trial from Terra Nova Nurseries, and had already purchased one from Dutch Gardens, but this is the first year of bloom for both of them. I really like them. Cape Diamond rose, new this year. I bought this rose at Der Rosenmeister this spring. You can see the ‘Cape Diamond’ rose, the foliage of ‘Dark Towers’ penstemon, ‘American Revolution’ daylily as well as many other familiar friends. Endless Summer Hydrangea: Where’s the Blooms? Wow! You have quite the vegetable garden! I have a nice bunch of annual poppies as well that all started with one volunteer years ago. I collect the seed for baking – yum! Enough scatters while harvesting the seed that I never have to worry about having poppies. I love the look of your birthday garden. We got hit by hail in June, so some of my July bloomers look like someone took a bat to them… but some are out of control! I have sedum.. hens and chicks and dragons blood that is bloomning! That stuff NEVER blooms in Colorado… Gardening is an adventure! .-= Chrissy Morin´s last blog ..Cats belong in the house and in the garden =-. 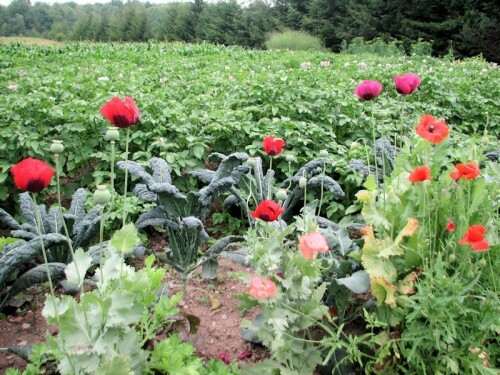 That’s a nice idea to put the poppies in your veggie garden. They look great with the potato and corn crops 🙂 My hubby found a volunteer poppy in our veggie garden this week. I’m glad to see the penstemon growing in your garden. It’s something I want to try. Love that cultivar. The smokebush is lovely too, and your new rose is such a beautiful shade of pink. The sun is struggling out there today, but at least it’s shining. I’m hoping to feel a bit more warmth on my shoulders soon! .-= kerri´s last blog ..Garden Bloggers’ Bloom Day-July ’09 =-. love that ‘dark towers’ penstemon! will have to find a place in my garden for that beauty. .-= Muum´s last blog ..Garden Blogger’s Bloom Day for July 2009 =-. Wow, that’s a lot of potatoes. Glad to see your garden growing well in spite of the cool temps and rain. I’m kind of loving this summer: no water fretting – at least not yet. 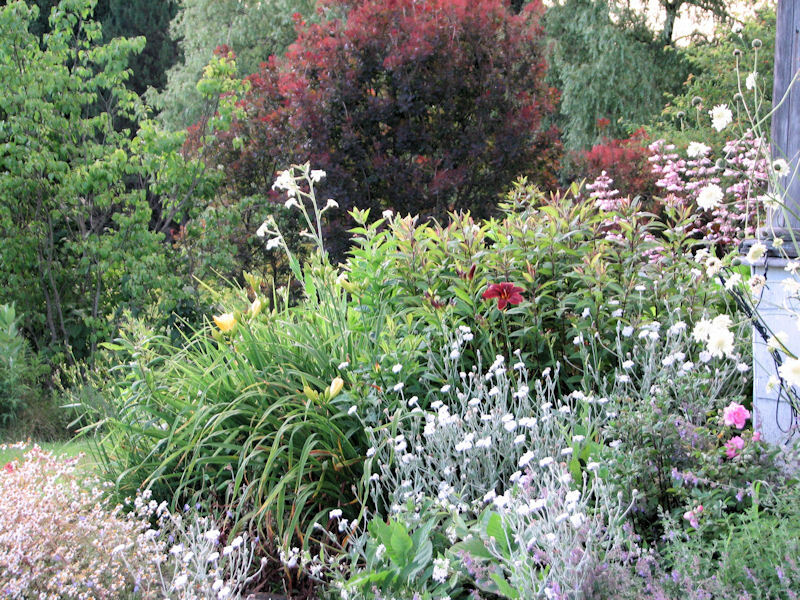 .-= Country Gardener´s last blog ..Be sure to check out this garden rant =-. .-= rosemarie´s last blog ..Foliage Fridays =-. What is Allegheny vine? I am not at all familiar with it. Now I know why those little fabric potato growers were too small for you! You certainly have lovely blooms and I enjoyed the view of the Birthday Garden. .-= Leslie´s last blog ..GBBD July 2009 =-. 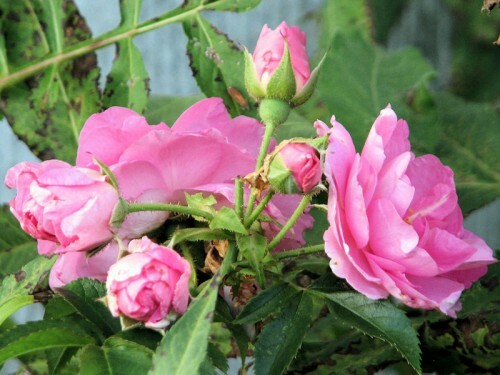 .-= Dee/reddirtramblings.com´s last blog ..Garden Bloggers’ Bloom Day: Hurrah! It’s July! =-. .-= jodi (bloomingwriter)´s last blog ..Rock-Garden Eye-Candy =-. It looks lovely! Thanks for sharing! .-= Sheila´s last blog ..Two and a Half Years Later =-. Oh, I wish I were there! But hey, I was, for just a moment. It is all so lovely. It makes me want to take a trip to NY. If it ever drops to 84 down here, we’ll be dancing in the streets! .-= Linda Lehmusvirta´s last blog ..From Linda: July 16, 2009 =-. I love the poppies! And that is a lot of potatoes. A lot! Thanks for joining in for bloom day! Your Poppies are so gorgeous! I particularly like the raspberry colored ones. 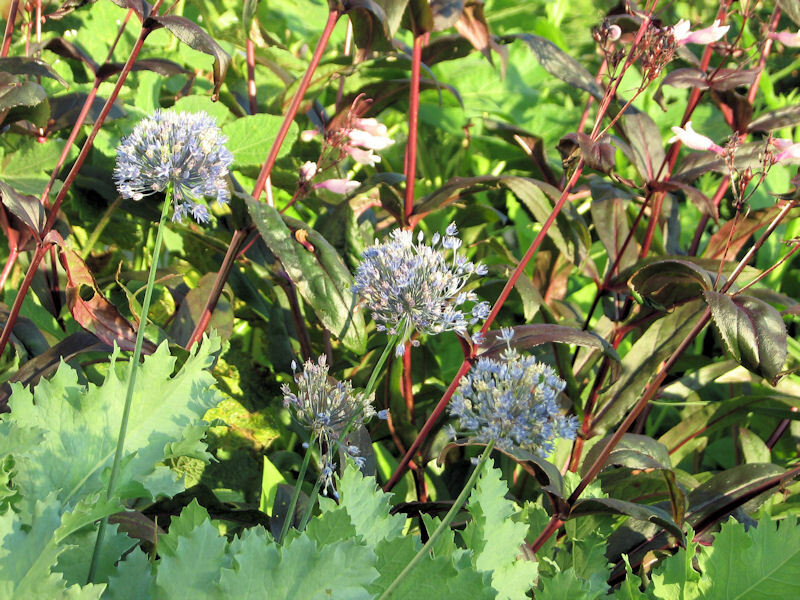 I grew Allium caeruleum at my last garden. It’s a nice one, blending well with just about anything. It looks great with the Penstemon, making a nice contrast. 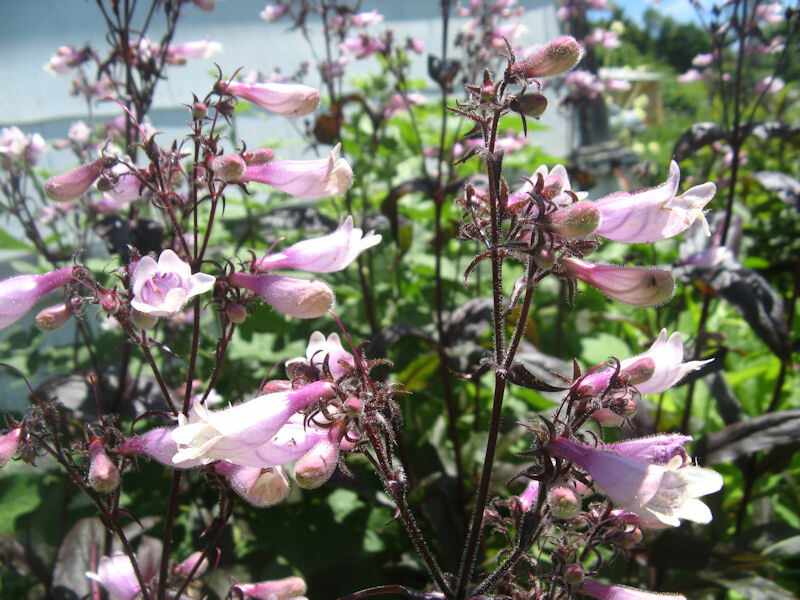 .-= Mr. McGregor’s Daughter´s last blog ..Yes, There Actually are Things in Bloom in July =-.